1. Please give some space after the newbielink: keyword Eg. newbielink: http://www.somewebsite. 2. [nonactive] causes confusion about the html link being active. It is already understood that when the mouse is taken near the link, no visual change occurs anyway. I saw that too, earlier. 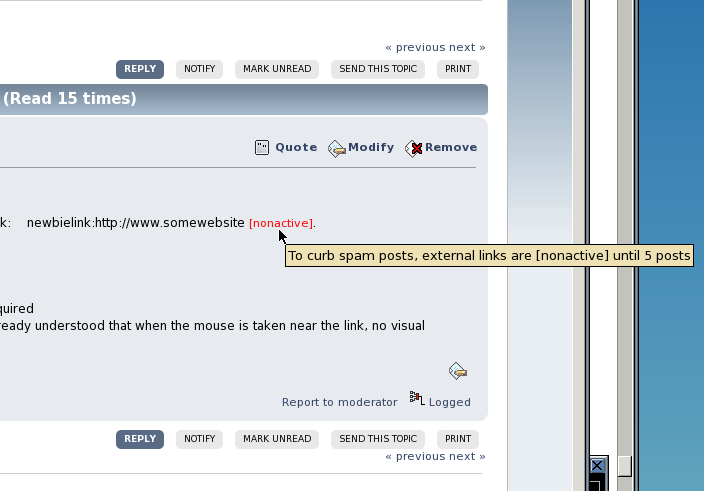 Still, the newbielink keyword is enough to alert users about possible spam posts before using them. Nonactive is not necessary and is understood anyway. Please give some space after the newbielink keyword. Thanks. Any possibility of getting the above implemented ? Thanks. Sorry, I don't make policy, I just moderate. Changes like that would be up to an administrator. Sorry to trouble you, Rich. I solved the problem now, by contributing my experiences to atleast 5 posts and my previous links get automagically activated, as you said. Thanks.